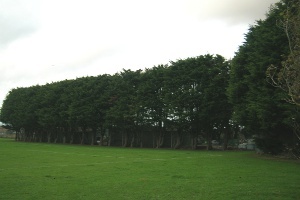 Brighton & Hove has an estimated collection of 12,000 street trees. These trees fall under our statutory works and are safety inspected on a rota basis every 2 and 4 years. On the second year they receive interim works (5.2m crown lift) and on the fourth year receive composite pruning (30% crown reduction,20% crown thinning and 5.2m crown lift). Our in-house arborists or contractors before starting pruning operations visibly inspect the tree for nesting birds and bats. Also when ascending through the canopy, holes, cracks and fissures are inspected and if any activity is suspected boroscopes are used to confirm nesting or roosts. A large majority of our street trees are Ulmus species and can only receive works between the end of September through to the end of May due to fresh wounds releasing pheromones which attract the Elm bark beetle that carries Elm disease. Due to the amount of trees and weather conditions we have to prune right up to the end of May to ensure our statutory works are completed. It is very unusual for tree roots to physically break underground drains and pipework. However tree roots will grow where conditions are favourable. An old pipe which is cracked and/or has poor joints leaking water into the surrounding soil will attract tree roots which are growing nearby. These may then exploit the weakness and enter the pipe, causing a blockage or further damage to the pipework. Often when repairs are required the nearest tree is blamed. The removal of trees in these instances is rarely required as replacement or repair of faulty drains and pipes with modern materials will usually eliminate the leak and prevent the problem recurring. Are you having problems with a neighbour's hedge? The Anti-Social Behaviour Act 2003 gives powers to deal with complaints about high hedges to district councils and unitary authorities. This means that provided they have attempted and exhausted all means to resolve the hedge dispute, potential complainants will be able to take their case to the local authority. At this point, the council will only be looking to adjudicate on whether "the hedge is adversely affecting the complainant's reasonable enjoyment of the property". In doing so, the local authority must take account of all relevant factors and must seek a balanced assessment of the concerns of both parties and the interests of the wider community. If you have read the leaflet and would like to submit a complaint about a high hedge, please download a form and guidance notes or contact the Arboriculture Service on 01273 292929 for the form and guidance notes to be sent to you. The Arboricultural Information Notes are intended to provide general information on a number of tree-related issues, from maintenance to an appreciation of associated wildlife. They are not intended to be specialist papers. It is hoped that the information provided will encourage you to research further into subjects that prove of interest by using books, the internet and practical visits to parks, woodland and the wider countryside. Periodically, this series of information notes will be added to. Any suggestions for subjects you would like included would be welcomed for consideration.